It took a little longer than he first anticipated, but Jim Southam was finally able to hold the grand opening for his new store Wednesday. 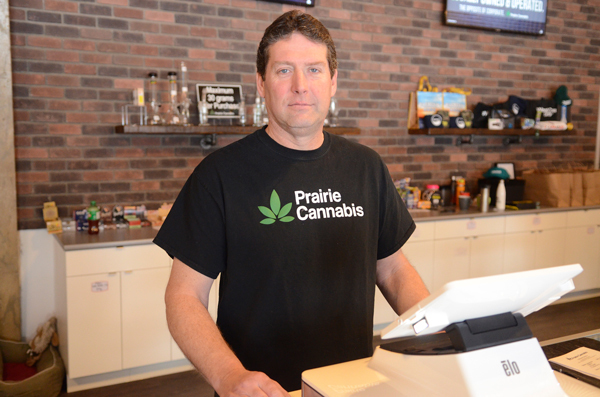 Southam is the owner of Prairie Cannabis, one of two retail stores licensed to sell recreational cannabis in Prince Albert. The store has been open since late 2018. Opening day saw people lined up to get the first look at what legal cannabis would look like in Prince Albert. “When we first opened it was really, really busy, even lined up at times, but it’s slowed down to a steady pace of customers coming in,” Southam said. Even Wednesday, mid-afternoon, there was almost always a customer or two coming in to see what the store had to offer. He’s also happy with the location, both in terms of where in the city his store is (on Second Avenue West across from Taco Time), and in which city he’s operating. “I’m really happy to be serving the community of Prince Albert and I look forward to getting involved in the community and doing my part to help out where I can,” he said. The launch has not been without its hiccoughs. Like many retail locations, obtaining a long-term, reliable supply of product has been a concern. “We are getting a fair amount of negative feedback over the price poaints that we have right now, and I don’t disagree with them,” Southam said. Those supply issues have also led to limited options for cannabis consumers. As of Wednesday, the store had just seven strains on the menu, ranging in price from $12-17 per gram (sold in 3.5 and seven-gram packages). The location also sells seven kinds of cannabis oils. News reports from Global and CBC have said Saskatchewan’s cannabis prices are some of the highest in the nation. Southam is hopeful that as time goes on, he’ll be able to expand his offerings. “Right now things are getting a little bit low, but we definitely want to increase the number of strains and products that we carry in the store in the next month or two,” he said. Until that happens, Southam will keep focusing on making sure his store is somewhere people can feel comfortable. The store was full of attentive staff. Despite the simple exterior, the inside featured wood panel-style flooring and a back wall façade designed to look like brick. “There’s been the phrase ‘it’s the Apple Store of cannabis stores,’” Southam said. “I didn’t want it to be too high tech because there are a lot of older people who consume it, and I really feel right now that people need someone to talk to to help inform them about their cannabis use. I really believe in one-on-one personal connections between my employees and the customers to help direct them in which products to use and how to use them. Prince Albert’s second cannabis store, Canaba, is also preparing to open. It’s located on Second Avenue West across from KFC.